People are giving Tide Pods five star reviews on Amazon for how they taste. Here we are, entering late-stage meme capitalism, with people posting reviews on Amazon like it’s Yelp for Tide Pods. The reviews are still mostly stacked with serious people’s serious opinions about their laundry habits, but as Business Insider first noticed, sprinkled in there are reviews touting the product’s taste and sharing recipes. For anyone blissfully unaware, people have been looking lustfully at Tide Pods since at least the product’s launch in 2012—and in 2013, a Straight Dope Forums user posted their tale of a friend’s elderly dad eating one by mistake. According to Know Your Meme, it wasn’t until two years later, in 2015, that this already sort of fucked-up candy-looking product entered meme canon, with the Onion’s seminal classic, So Help Me God, I’m Going To Eat One Of Those Multicolored Detergent Pods, written from the perspective of a relatable, idiot child. In 2017, CollegeHumor’s video Don’t Eat The Laundry Pods cemented them into memedom. In the past, Amazon has moderated its product reviews, taking down reviews of Michael Wolff’s, Fire and Fury and Hillary Clinton’s What Happened when comments crossed their Community Guidelines. But Tide Pod reviews exist in a gray area of these guidelines: The closest rule they come to breaking is “content advocating or threatening physical or financial harm to others,” under the Illegal Activity heading. YouTube said it would flag and remove videos of people attempting the Tide Pod Challenge for a similar reason. It’s not illegal to eat a Tide Pod, however, or gush about how much fun it was to munch on a detergent packet. "Customer safety is of the utmost importance and we suppress Customer Reviews or other content that encourages physical harm," an Amazon spokesperson told me in an emailed statement. The company is deleting reviews that encourage people to eat Tide Pods. “Put ‘em in a pop tart sammich,” wrote Karla Richardson. “I like to slap one of these bad boys in between two pop tarts. Delicious. Side effects are a bit weird though.” Don’t do this. “A flavor like no other,” ¿$©¢£€ wrote. “I've been using these for years as a flavor enhancer for my water. The only issue is that they have a hard time dissolving in my Yeti cup, so I've started extracting the liquid goo with a needle and then squirting it into my water.” They go on to describe the weight-loss benefits to eating Tide Pops. Please don’t do this. 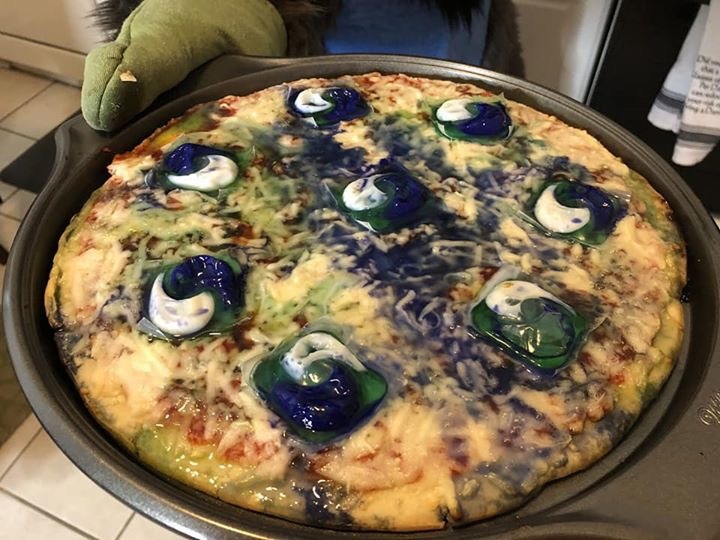 Justin McIntyre here references a meme within a meme: that one time someone put Tide Pods on pizza and baked it. Yeah I’m headed out to think about my life right now, Mohamed Babieker. Ingenuity here from Cody, ‘preciate it dude. “When I popped atleast 9 in my mouth I felt like I was high but it was calming like the Lord was present.” Go with God, Omanqual Juansonling. “These taste terrible.” Shayla Johnson, thank you. This is where I have to say, explicitly, again, do not do this. Tide Pods taste nasty (I assume), but can also be dangerous to your health. The American Association of Poison Control Centers told ABC News that about 40 cases of Tide Pod poisoning have been reported in 2018 so far, half of which were intentional. Perhaps the most absurd thing about these tasty-looking boys is that they were ever allowed to exist at all. Update, 2:55 p.m. EST: This article has been updated with comment from Amazon.